madonna-tv.com: 1987: Madonna's Coming Soon! This week 25 years ago, Madonna was off to Japan in preparation for the worldwide premiere of her 1987 Who's That Girl tour. As part of her first ever world tour, the Japanese concerts taking place in June 1987 were set to be Madonna's career debut full-scale performances outside of North America. The build-up and hype surrounding Madonna's visit to Japan was evident from the production by Warner-Pioneer of a promotional video special entitled "Madonna's Coming Soon". 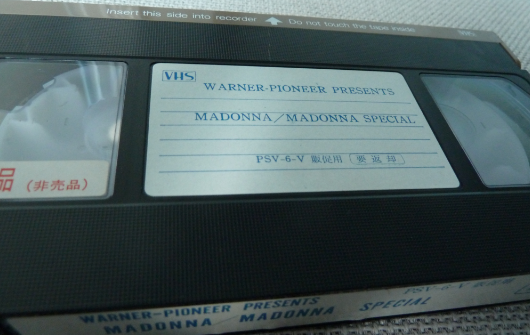 The unique 45 minute documentary looked back at Madonna's career to date using archive interview, TV and music video clips, and was issued in advance of Madonna's arrival in Japan as a promo-only VHS video tape. Here's a quick look at what was included on this most rare of Madonna video collectables!